US authorities named Russian national Evgeniy Bogachev as the face of a malicious software scheme responsible for stealing millions from people around the world, after a successful campaign to disrupt two major computer networks. Digital police from across the globe announced they had seized control over the weekend of two computer networks that had been used to steal banking information and ransom information locked in files on infected computers. But they warned people with infected computers to take action now to prevent further attacks. US and European officials announced they had managed to crack the malicious software (malware) known as Gameover Zeus that had been used to divert millions of dollars to bank accounts of criminals. The authorities have also cracked Cryptolocker – a viral scam that shutout hundreds of thousands of users from their own computers and ransomed the data. The UK’s National Crime Agency (NCA) told British victims that they have a two-week window to protect themselves, after working with the FBI, Europol and other law enforcement bodies to temporarily seize control of the global network of infected computers. According to the FBI’s “cyber most wanted” list Bogachev has been using variants of the Zeus malware since 2009 and communicates using the online monikers “lucky12345” and “slavik”. Gameover Zeus (GOZ) started appearing in 2011 and is believed to be “responsible for more than one million computer infections, resulting in financial losses in the hundreds of millions of dollars”. “He is known to enjoy boating and may travel to locations along the Black Sea in his boat,” according to the FBI. The Cryptolocker software locked PC users out of their machines, encrypting all their files and demanding payment of one Bitcoin (currently worth around £300, or $650) for decryption. It’s believed Cryptolocker, which the FBI estimated acquired $27m in ransom payments in just the first two months of its life, has infected more than 234,000 machines. A chief suspect from Russia has been identified, but is still at large, Troels Oerting, head of Europol’s European Cyber Crime Centre (EC3) told the Guardian. He said other arrests related to the operation were “in progress”. 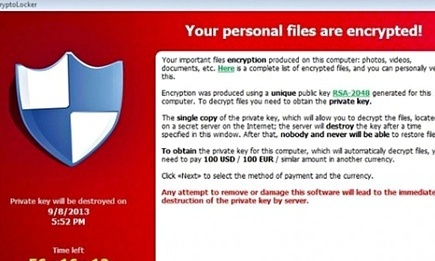 The global effort to stop the spread of the Cryptolocker ransom-ware has focused on its delivery method, GOZ. The malware connected infected machines by peer-to-peer connections – in theory making it harder for the authorities to track and stop. GOZ was designed to steal people’s online banking login details, who were usually infected by clicking on attachments or links in emails that looked innocuous. However, it also dropped Cryptolocker on their computers. “Nobody wants their personal financial details, business information or photographs of loved ones to be stolen or held to ransom by criminals,” said Andy Archibald, deputy director of the NCA’s National Cyber Crime Unit. Affected users are being advised to update their operating system software and security software, and also to “think twice before clicking on links or attachments in unsolicited emails”. Not-for-profit body Get Safe Online has worked with the NCA to launch a dedicated section of its website to provide guidance and tools, although at the time of publication the website appeared to be offline. Behind the scenes, the law enforcement groups have been taking over points of control in GOZ’s peer-to-peer network: an action known as “sinkholing” in the security world. By doing this, they have been able to cut off criminal control over the infected computers. Dismantling peer-to-peer operated malware is difficult, but it has been done before: for example one case of a data-stealing virus called ZeroAccess, which infected as many as 1.9m PCs in 2013. In that case, security researchers from Symantec managed to send lists of fake peers to infected machines, which meant they could no longer receive commands from the controllers of the malicious network, known as a botnet. Symantec researchers said today that key nodes in GOZ’s network had been disabled, along with a number of the domains used by the attackers. Oerting told The Guardian the entire GOZ’s operations infrastructure had been sinkholed, meaning the malware should “not reappear for … considerable time”. Although arrests have not yet been made, Oerting believes the eventual impact will be “great”. “[It will not last] forever, but the infrastructure is gone and the criminals will have to build and distribute from scratch,” he added.